YOU see the Allopaths arrived first, with Hippocrates, and quickly seized all the natural strongholds,—popular ignorance and superstition, the laissez-faire instinct of the mob to be led or driven, and the panicky animal fear of pain and death. These they further fortified with traditions of medical learning and omniscience; with the alleged inability of the lay mind to grasp any ordinary physiological fact; and the pleasing fiction that every physician is a man of science, holding the only key to health. And most potent of all the adventitious aids making for Allopathic exclusiveness and supremacy, is the veil of secrecy and mystery which has ever hung over their activities, and which the elaborate foreign and technical nomenclature of the medical schools rendered well-nigh impenetrable to the laity. The element of mystery in medical practice, which has been such a source of profit to its votaries, was early and easily injected because of the notion among primitive peoples that disease was a manifestation of some occult power for evil; hence the first practitioners of the healing art were also the religious teachers — sorcerers, soothsayers, and the priests of the various altars, who sought by mystic signs (the forerunners of modern pharmaceutical cipher) and incantations, sometimes by the torture of the afflicted ones, to drive out the indwelling demons of bodily distempers. A favorite method of expulsion was by administering concoctions from poisonous herbs, and in order that the dose might not kill the patient as well as his tormenting evil spirit, it became necessary for these early practitioners to study the nature and properties of herbs and minerals, to calculate their effects on the human system, and learn how much could be taken with impunity. This was the origin of the “medicine men” and the elaborate drug baiting which subsequently held malign sway over sick humanity through many centuries, but which happily now shows a tendency to peter out in the sale of soap, perfumery, and tooth-brushes. The art of healing in some form is as old as the race, and strictly speaking there is no “Father of Medicine,” although Hippocrates won the title by creating for it a literature, and by founding a school of medicine which bore the designation “Dogmatic,” as teaching and practicing in accordance with a general principle and not empirically. He thus placed his art upon so firm a basis that later teachers have generally preferred to imitate or modify what he set forth, rather than venture upon new fields of inquiry. The maxim has been imputed to Hippocrates: “Sacred knowledge may be communicated only to the initiated ; the profane may not be taught before their initiation,” and the vow of secrecy imposed upon the novitiate in his school was styled the “Hippocratic Oath.” doubt this was an inheritance from an earlier practice when it was accounted sacrilege for any to intrude upon a priestly function; he was certain to meet the fate of Korah and King Uzziah. Pliny relates that Galen, in the Second Century, narrowly escaped mob violence at Rome, for delivering a series of public lectures on anatomy at the request of the leading men of the city, noblemen, savants, and philosophers, among them the Emperor Marcus Aurelius, but for whose protecting favor, the famous physician would probably have been arraigned and put to death. For he was charged with “a violation of the code in force among Roman physicians, as well as of the so-called Hippocratic Oath, which forbade the instructing of nonmedical persons in any of the mysteries of professional knowledge.” The historian declares this to have been merely “the desired pretext” for venting upon Galen the jealousy and enmity of the Roman guild of physicians, who hated him because “he was infinitely their superior in skill, erudition, and liberality of sentiment.” Very significant of the power of this Roman medical guild over the minds of the Roman populace, however, was the fact that despite the powerful friendship of the Emperor, Galen was compelled to desist from lecturing, and was denounced by all the ribald epithets—”quack ” among others—current among the medical nien of that period, until in disgust he left Rome and returned to his native Pergamos. Later he was summoned by Antoninus to accompany him on a military expedition, and afterward became the physician of the Imperial family. Thus it appears that medical bigotry and intolerance, professional jealousy and hate, have gone hand in hand with the development of the Healing Art from time immemorial; and knifing therapeutic colleagues has ever been a favorite pastime with the gentlemen who neglect no opportunity to laud the “nobility” of their calling. As time went on, the Allopaths, like all monopolists, waxed rich, and in common with other rich folks, were very influential with governments. With political power added to their superstitious control over the minds of the masses, they were able to build up a system which up to the present has been practically impregnable. It had in it the absolutism of kings, the slavocracy of medieval priest-craft, and the plunderous graft of modern commercialism. Entrenched behind this triple-barred fortress, members of the Allopathic school were in position to Mag their heads derisively at the exponents of other therapeutic systems. 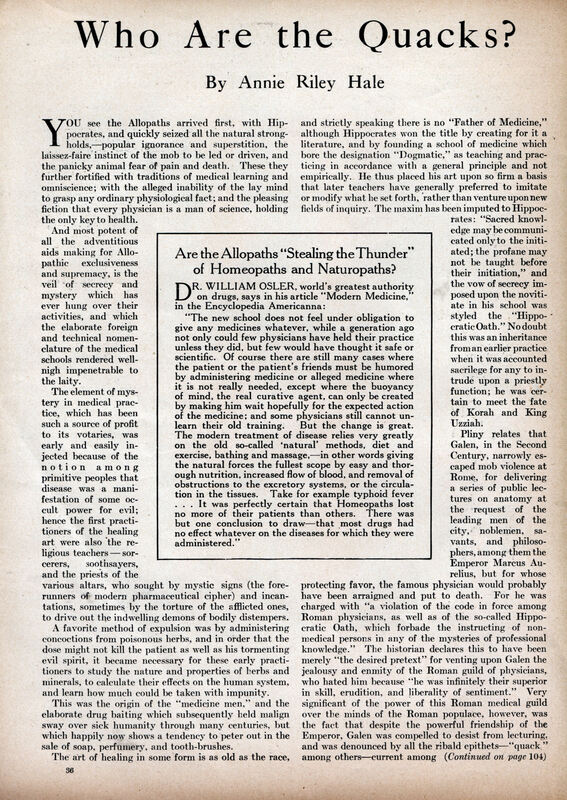 They christened themselves the “regulars,” and all others were faddists, cultists, and “quacks”; the last named being the favorite epithet for all dissenters from Allopathic faith and practice, and lias been applied indiscriminately and with equal ictus to the scholarly founders of the Homeopathic and Naturopathic schools of thought, and the illiterate vendors of hair tonics and corn plasters. The first to feel the fires of persecution in this movement, were the exponents of Homeopathy and Natural Therapeutics, the demonstrated efficacy of whose methods had won them many adherents in the latter part of the eighteenth, and early part of the nineteenth centuries. Hahnemann, the founder of the Homeopathic school, was forbidden to prepare or dispense his own medicines, was finally driven from Leipzig and took up his abode in Paris in 1835. His disciples continued to be fined and imprisoned in Germany and other European countries, and when they crossed the Atlantic— which they did in 1825—they met the same chilling hostility in America. Their efforts to found Homeopathic schools and colleges to spread the new doctrine were blocked by flocks of Allopathic birds which they found perched in every State capitol, ready with sharpened bills to peck to death every therapeutic innovation; the same flock which later met the Osteopathic applicants for legislative license, and which are not pecking so furiously at the petitioning Chiropractors. Even so dignified and important a personage as the head of the New York Neurological Institute, told the writer he had taken the time from his busy life to go up to Albany a few years ago, in company with other eminent “regulars,” to help defeat a bill before the New York Assembly for Chiropractic State licensure. “And if you could have seen the bunch of illiterate ignoramuses who were there to push that bill!” exclaimed the head neurologist, as an expression of unspeakable disgust spread over his broad face. It did not seem to occur to this eminent neurologist that he and other opponents of Chiropractic licensing, were chiefly responsible for the illiteracy and ignorance of individual Chiropractors, which unquestionably exist, and may work harm in some instances—t hough whether more than frequently is wrought by Allopathic blundering, is questionable. Certainly, the most illiterate Chiropractor could not display more ignorance of practical dietetics in the treatment of disease, than was displayed by this same head neurologist in a memorable case of which the writer had personal knowledge. Be that as it may, it is obvious, that but for the powerful opposition of the Allopathic school, Chiropractors would long since have received the same authority from the State to practice their method that is accorded the exponents of other therapies, and with the license some safeguarding provision requiring a certain amount of academic and medical training. Thus would be insured to the Chiropractic physician as good a knowledge of English and miscellaneous subjects as is owned by the average Allopath, and at least a workable knowledge of anatomy, physiology, and hygiene, which undoubtedly every one who essays to treat the human body should possess. Are the Allopaths “Stealing the Thunder” of Homeopaths and Naturopaths? Creationists could take lessons from the author of this piece. She was an idiot. Waxing eloquent on the “efficacy” of nonsense like homeopathic medicine while in her 1935 book titled “Medical Voodoo” she waged an anti-vaccination campaign. Sounds like a more articulate Jenny McCarthy of her day. Well pre-WW2 medicine was fairly primitive by our standards and at time there was little difference between having medical treatment and having none. If you got sick either you would live or die and nothing would change that. Most drugs available at the time in 1922 were barely suitable for treating the symptoms, there exist a scant few drugs that could actually treat a disease. Arsphenimine had only been in use for 12 years at the time this article was written and Neosalvarsan for 10. These were the first drugs to be shown to be effective in treating a disease (syphilis), though the course of treatment was about a year. This was a decade before the discovery of sulfanilamide which was effective in the treatment of typhoid fever before antibiotics. Now days typhoid fever can be cured with the judicious use of penicillin. The author’s condemnation of the Hippocratic Oath (en.wikipedia.org/wiki/H…)show either a lack of knowledge of the oath or an attempt to deceive her readers. The only keeping ‘secrets’ reference is about what is learned of or from the patient. The little insert with the quote from Dr. William Osler is a great touch. Many people at the time might have heard of him as one of the founders of John Hopkins Hospital. The sad part is Dr. Osler had been dead for 3 years at the time of this article. Homeopathy and Naturopathy had have no basis in science. They present apocryphal stories as proof, and perhaps hundreds die each year by following their advice. Do you know what happened to the guy who overdosed on homeopathic remedies? LightningRose: Unlike the guy who drank water (as in homeopathic remedy) instead of taking medicine that could have helped. Died. Yeah, I do know. Do you? Or maybe you’re talking about the guy who took Zicam marked as a homeopathic remedy and lost his sense of smell. Or maybe you mean the folks that took homeopathic remedies made with arsenic? And just in case anyone is stupid enough to classify the first website I linked to as “propaganda” here is a relevant story from the British Daily Guardian about a woman who died of a heart attack because she drank water (homeopathic remedy) instead of medicine. LightningRose: I know that you have your head screwed on straight, I just lose my sense of humor when this kind of stuff comes up. So if like cures like, when you break your leg should I kick you in the shin? It’s true that the resources of medicine were limited until fairly recently. However, potent analgesics such as opium, and laxatives of various kinds, were around for a long time. Also, antiseptic ointments existed for centuries. More recently, there was aspirin – despite other remedies being preferred now, due to Reye’s Syndrome, it was an effective drug for dealing with a high fever. Note the violent reactions of homeopaths in the comments below. I love the aftershave ad on the second page. You could not write more macho copy than that with a brush made from Chuck Norris’s beard trimmings, but the man illustrated appears to be wearing lipstick. John, Zicam and the arsenic you used as an example were not true homeopathic remedies. And yes, it’s true that much harm can be done when quack remedies are used in place of real medicine, but I stand by my (implied) claim that homeopathic remedies by themselves are incapable of causing harm. LightningRose: Yeah, because they’re only @#%^*ing WATER! Yeah, the zinc in Zicam wasn’t diluted away to nothingness like a “proper” homeopathic humbug, but my point was that the product was clearly labeled as homeopathic. I hate to break it to you but arsenic oxide is indeed a part of the whole homeopathic nonsense.